Zitelle is the easternmost waterbus stop on the island of Giudecca, a few meters away from Andrea Palladio and Jacopo Bozzetto's Church of Le Zitelle (shown at right in the satellite image above). Belmond Hotel Cipriani (five stars), a celebrated resort hotel that has catered to movie stars, monarchs, industrialists, trust-fund bambini, and other moneyed guests since the 1950s. Bauer Palladio Hotel & Spa (five stars), a luxury hotel in a converted 16th Century convent with private gardens. Generator Venice (one star), formerly the Ostello Venezia or Venice Hostel. 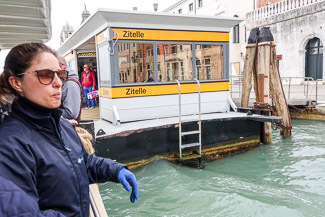 Note: Zitelle does not have a ticket booth or vending machine, so here's what to do if you need to board a water bus without a valid ticket or Tourist Travel Card.